A High-Quality Backpack For All Kinds of Travelers. After three years of travel, I'd become less about being a minimalist and more about carrying home comforts. While packing light is still a rule I think the majority of travelers should live by, I no longer wanted to pack as light as I had been. Out went my beloved Osprey Exos 46, and in came an Osprey Farpoint 70 instead. Why the Osprey Farpoint 70 Backpack? I prefer Osprey backpacks because of their lifetime guarantee. They’ll repair or replace any backpack of theirs that breaks, even if you bought it 20 years ago! While that might not be too much use if a strap falls off while you’re backpacking in Mongolia, it shows me the company has faith in their products.After my Osprey Exos lasted me three years before the baggage handlers at PDX airport destroyed it, I was looking for something by the same company. I decided on the Farpoint range because I was looking for a front-loading backpack instead of a top-loading one. Front-loading backpacks typically allow you to padlock your bags shut for greater security, and make packing and unpacking much easier. I opted for the Farpoint 70 over the 55 liter option – with the main backpack having a 55 liter capacity and detachable daypack adding an extra 15, I could keep the daypack empty most of the time but fill it up when I needed to. I found the Farpoint 70 to be a great choice – even more so than my previous backpack. It’s comfortable, robust, and has lots of nifty features for travelers of all shapes and sizes. One particular feature I've grown fond of is being able to unzip the daypack and clip it to the straps of the main pack, allowing it to hang from the front without needing to carry it. It helps balance the load so I'm unlikely to topple over, and means all my important documents are within easy reach in my daypack. Most importantly, it’s comfortable when wearing for several hours at a time. The shoulder and hip straps are well-padded so they don’t cut into my skin, which is great for the times I'm wandering around an unfamiliar city in search of a hostel. Having a detachable daypack included is helpful. It can be quickly unzipped to use as hand luggage at the airport, or while exploring a new city with the main backpack left behind in my room. Having a separate mesh section in the main backpack helps keep the pack organized – I use mine to keep dirty washing away from clean clothes. I had the opportunity to test out the international warranty service first-hand, when my backpack arrived on the luggage belt with a large rip in the side coming off a domestic flight in Thailand. I patched it up with duct tape for a few weeks, then contacted the Australian Osprey distributor to find out about warranty options when I arrived in Melbourne. Within a few days, a local agent had repaired the damage, and I had a fully-functional backpack again, at no cost to me. Now that's good service! I've now owned the pack for two years, and traveled around the world with it. It's still going strong, with no visible signs of wear or damage. I can't ask more than that. If you do decide to keep the daypack attached to the backpack and fill both to the brim, you’ll find the combination sticks out so you look like a giant turtle. Not only that, but the small length and large depth is likely to leave you unbalanced as you walk. Finally, its awkward shape can make it hard to fit the pack into luggage areas on trains and buses when stuff full. This backpack is definitely at its best when at less than three-quarters capacity. Any more than that makes it unwieldy, although still fine in a pinch. 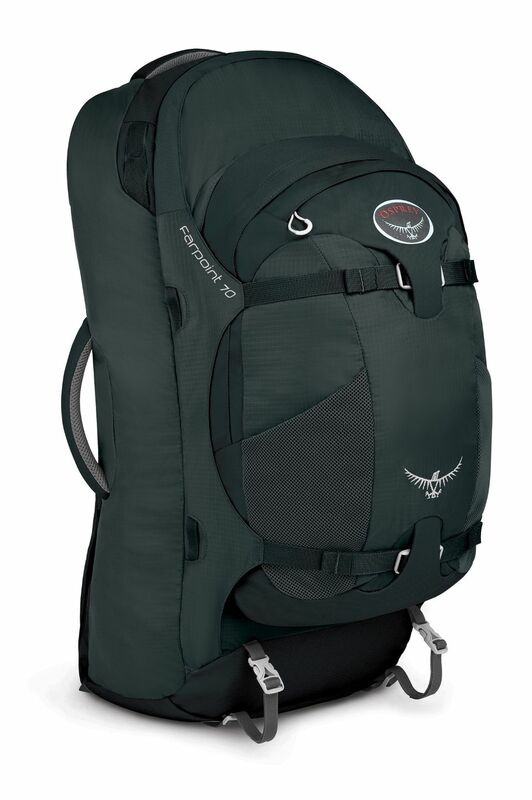 The Osprey Farpoint 70 is a high-quality backpack that will suit all kinds of travelers. It’s not the cheapest backpack on the market, but its robustness and lifetime guarantee mean you’ll be using it for years to come. I think it’s a great option. Recommended.